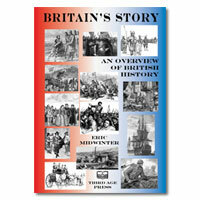 This an attempt to offer adults with a general interest in national history a concise summary of that 2000 year epic. It is hopefully designed to enable some to arrange random, vague gobbets of information in orderly fashion and to whet the appetite of others to read further. It is customary to look back chronologically at history from the current standpoint with less recent events diminished and more recent events magnified. This brief narrative endeavours to provide more of an overview, looking down rather than back and seeing events against a more natural time pattern, trying to judge the relative significance of happenings over the same temporal perspective. With a very concise text and a concentration on events that played an important part in the evolution of today’s Britain, there are some changes of emphasis from the normal historical record. The moral may lie in acknowledging that our predecessors enjoyed, if they were lucky, a similar time-span as we do today. We know that, at least since 1066, something like 5 to 10% of British inhabitants lived to be over sixty. They would have personally witnessed much the same length of ‘history’ as their descendants today, whether it was a phase of woe or unrest caused by the Black Death, the English Civil War or World Wars I and II or maybe a more peaceable phase. Every life, on immediate criteria, is just as vastly important and, against the canvas of 2000 years, just as minuscule in impact as any other. And the same applies to each passage of history from the sparse few gathered around the Iron Age encampments to the crowded many in the confused tempo of early 21st century Britain.